Great for use outdoors or when very long lasting fog effects are needed and recommended for use in Larger sized facilities or outdoor spaces. Swamp Juice by Froggys Fog is a water based fog machine fluid formulated to create an extremely long lasting / super long hang time fog. 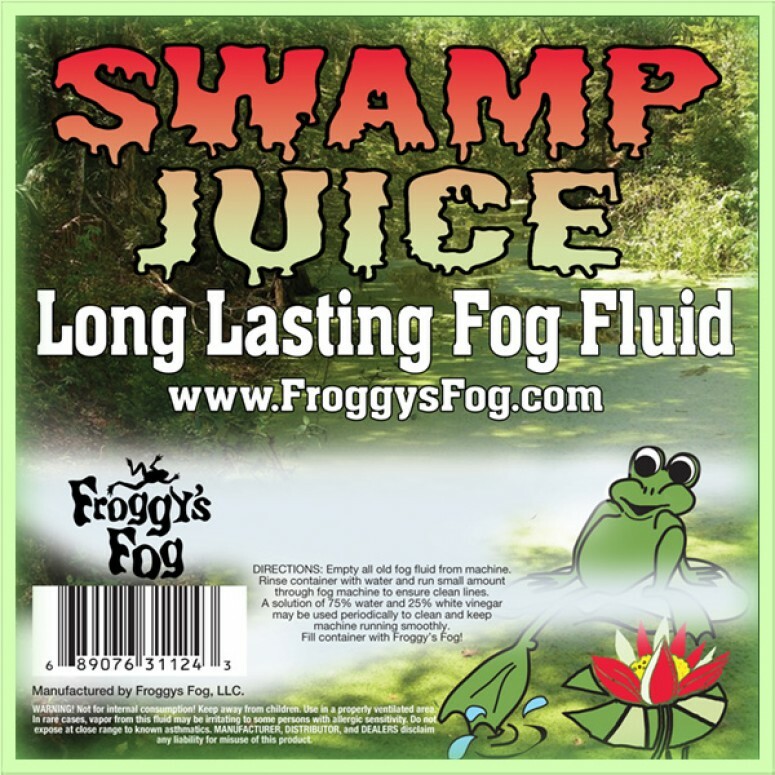 When you hear about Froggy's Fog, you almost always hear the words Swamp Juice as it has a hang time of up to two hours, resulting in less fluid consumption and less wear and tear on your fogger. It is being used by thousands of theme parks, haunted attractions, laser tags, skating rinks, family entertainment centers, nightclubs and in many more places. It has been featured on the TV Show "World's Greatest..." as the World's Greatest Fog and Froggys Fog has even won the International Association of Haunted Attractions Vendor Excellence Award for all the great things Swamp Juice has done for the Haunted Attractions Industry. Some of our great clients are Universal Studios, Busch Gardens and Six Flags. Swamp Juice has also been used by the military in Urban Warfare Training Centers and by Police and Fire Departments for Simulated Smoke Training. It is perfect for so many applications they are hard to name, but if you want an extremely long lasting fog with great dispersion properties, and does not have an obnoxious odor this is it. Froggys Swamp Fog Juice can be used in any water based fog machine. It is made from the highest quality pharmaceutical grade chemicals and with the amazing results you will see from this fluid, it makes Froggys Swamp Fog Juice the perfect alternative to high priced retail fog fluids. All Froggys Fog and Haze Fluids are made from lab-grade UV-Filtered de-ionized water and pharmaceutical grade chemicals, each approved by the FDA.